Four State Solution is a most appropriate title for the new release by long-distance collaborators Steve Stoekel (Spongetones), Bruce Gordon (Mr. Encrypto), Joel Tinnel and Stacy Carson. After some online banter during broadcasts of Dana & Carl’s This Is Rock ‘n’ Roll Radio (the best three hours of radio on the whole friggin’ planet, by the way), the guys decided to work together despite the distance impediment (each lives in a different state). Thanks to Facebook and the wonders of modern technology, they’ve formed a Pop Co-op and given us their debut release, a collection of a dozen catchy and engaging pop songs. “The 12 songs on this CD were written, recorded, engineered, produced, and mixed by four guys who have never been all in the same room together. It started as a songwriting project with various people on Facebook; I would come up with a title or concept and we would compose a song together. Along the way, some of the folks involved in these projects evolved into this band. Joel Tinnel , Bruce Gordon and Stacy Carson joined me, and we started working on these tunes, collaborating on lyrics and melodies through Dropbox. Each of us had a digital recording program that allowed us to record parts and share them. While there’s no substitute for being in the same room working on songs, the reality is that only a certain amount of time is allotted, and you’re all on the clock. If you don’t have a million dollar budget, you’re not going to be staying for months at a time near a large recording studio. Time is a luxury, and you have to be ready to hit the mark when you’re in the studio. Long distance recording on the other hand can happen at any time. I’ve recorded stuff at midnight, in the morning or anytime I felt like it. Bruce, living in LA, was three time zones away from us, which would’ve been a problem if not for technology. It should come as no surprise that the songs in Four State Solution should be as diverse and varied as they are. For me, the record is particularly satisfying because all parties involved brought a pop sensibility to the table. This resulted in a collection of catchy, melodic pieces that are enjoyable well after their initial spin on the proverbial turntable. “Trick of the Light” stands on its own lyrically as a wonderful piece of poetry. Delicate without being saccharine, there’s a kind of vulnerability to it. It’s almost as if any wrong move or misplaced note could have sent this song tumbling into nowhere. That’s what makes it such a triumph in my eyes (or ears, as it were). Every note had to be perfect. And it is. By contrast, “Big Idea” requires an entirely different treatment. Joel Tinnel’s vocals are balls-y to say the least. And that suits this song just right. Doors fans will dig “Sensible Flats” while “It Ain’t Easy Being a Boy” is right out of the Spongetones playbook. Catchy as all get-go and a sure-fire hit with power pop fans, the song is a great way to end the disc and leave people wanting more. “Lila” may be my favorite track on Four State Solution, though. Co-written by Stoekel and Tinnel, this slice of Revolver era Beatles employs some of the same elements that made The Beatles the pioneers of psych-pop that they were (ya just gotta love those backward guitars!). It reminds me of my first time I heard XTC‘s Apple Venus. I had to catch my breath after listening to it. Finally, Todd Rutt’s thematically ideal cover design conveys the collaborative spirit of the project while making for great CD packaging. 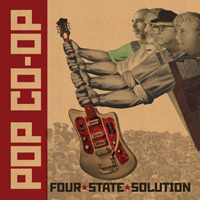 Get your copy of Pop Co-op’s Four State Solution at CD Baby or their Bandcamp page.